Our opinion: As he gets ready for retirement next summer, Brown will be remembered for passage of the 2016 bond measure. It's difficult to overstate the impact that Ernie Brown has had on Tigard and Tualatin. 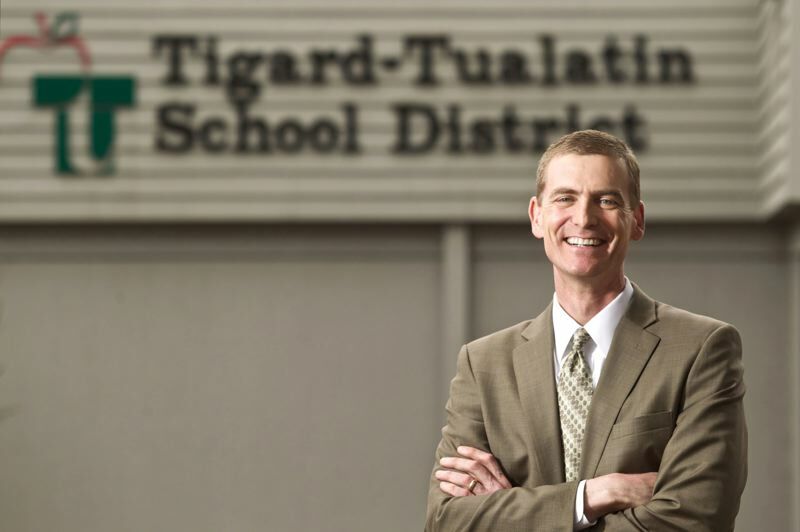 The superintendent of the Tigard-Tualatin School District announced last week that he will retire at the end of the 2017-18 school year (See story, Page A1). Brown is far from being the longest-serving superintendent in the state, or even in Washington County. He only came to the job in 2013 when then-Gov. John Kitzhaber tapped Rob Saxton to leave the post and become the state's schools chief. But Brown has a highly unusual pedigree. The lifelong educator spent his entire career in just one district: Tigard-Tualatin. Such total, career-wide dedication to one district does happen — Superintendents Matt Utterback at North Clackamas and Krista Parent in South Lane come to mind — but it's rare in this state. Brown's first job with the district was as a physical education teacher at Fowler Middle School back in 1988. Then he became a classroom teacher. He was an assistant principal and a principal. He served as an administrator — both in human resources and operations. And then the top job. He likely will be remembered most for leading the successful $290 million bond campaign last year. This summer saw the first of many projects break ground: classroom renovation, office relocation and seismic upgrades at Fowler Middle School; track resurfacing at Tualatin High School and Hazelbrook Middle School; cafeteria and classroom repairs at Durham and Deer Creek elementary schools; and playground drainage and turf installation at C.F. Tigard Elementary. This coming spring, construction will start at Woodward, Templeton and Byrom elementary schools, and Bridgeport Middle School. And construction on Templeton Elementary, Tigard High and Tualatin High is planned for next summer. Insiders say Brown was hands-on during the all-important bond campaign and remains hands-on now that the projects are underway. That includes an impressive array of efforts to keep parents, taxpayers and stakeholders apprised of each project; overseeing budgets; and having a say in the look and feel of the redesigned buildings. The president of the Tigard-Tualatin Education Association — the teachers union — might be expected to be a naysayer here. After all, a union and an administration typically lock horns on a wide array of issues. But when reached this week, Association President John Weber said, "It's a big loss for the district.... A lot of credit goes to Ernie for his leadership." Weber — a social studies teacher at Tigard High School — said Brown's experience serving at every level of the district gives him a broad understanding of how things work. "He understands what classroom teachers are going though; what administrators are going through... and the back-and-forth with the association." Susan Stark Hayden, the district's long-serving spokeswoman, said her boss often works 12-hour days in the office. But as the rest of the community can attest, his days don't end there. Brown regularly can be seen at a band concert, a basketball game, an elementary-school program, or at any of the myriad of community budget meetings. The "life cycle" of a public school district — it's the same for community colleges — can be measured by bond measures. Typically, a district spends a few years planning for a measure; spends a year convincing voters of the need; then gets through election night. And, if successful, goes through the next five years, give or take, fixing schools, building schools or buying land for schools. Only to start all over again as aging buildings continue to age. One metaphor for the decade-long process is NASA's old space shuttle program; when the shuttles landed at Edwards Air Force Base in California, it lined up for the landing somewhere over New Zealand. After that, it was along slow glide plane toward success. Much like a bond measure. Brown was at the helm for the 2016 bond measure, and the district — as well as the cities of Tigard and Tualatin — will benefit from that for decades to come. It seems a fitting time for him to take retirement. We wish him all the best luck.